Game 3 of Canberra Roller Derby League’s 2017 home season is on Saturday 27 May, when the Surly Griffins will take on the Brindabelters. Both teams are desperate to keep their 2017 Grand Final chances alive, and both will fight tooth and nail (or hip and wheel) for the win. In the first game of the 2017 home season, the Griffs met a strong Red-Bellied Black Hearts’ lineup. Despite keeping within a few points of the Hearts throughout a hard-fought game, the Hearts pulled away in the second period to take the win. The Griffs are unlikely to let it happen a second time this season and will be sharpening their talons for the Brindabelters. Despite an amazing display of rock-solid defence, the experienced Belters pack couldn’t stop the Black ‘n’ Blue Belles taking away the win in Game 2 of the 2017 season. But with many of the Belters’ lineup playing some incredible derby, taking CRDL’s travel team, the Vice City Rollers, to a resounding victory at the East Coast Invitational Tournament earlier in May, the Belters are hitting their stride for 2017. Your homegrown heroes on wheels roll out at the Southern Cross Stadium in Tuggeranong on May 27. Doors open at 6 pm, first whistle at 6.30 pm. Tickets are available through Moshtix and on the door. 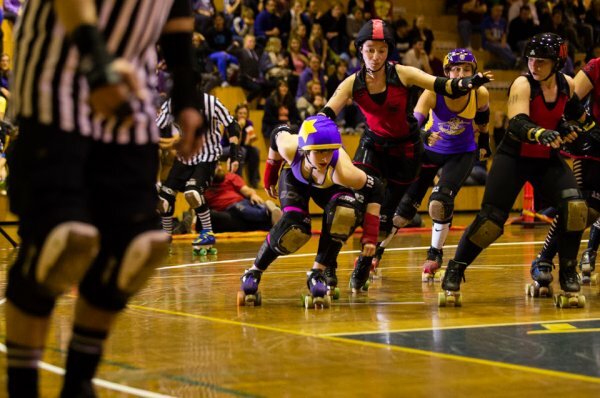 For more information about Canberra Roller Derby League visit us at www.canberrarollerderbyleague.com or on Facebook.